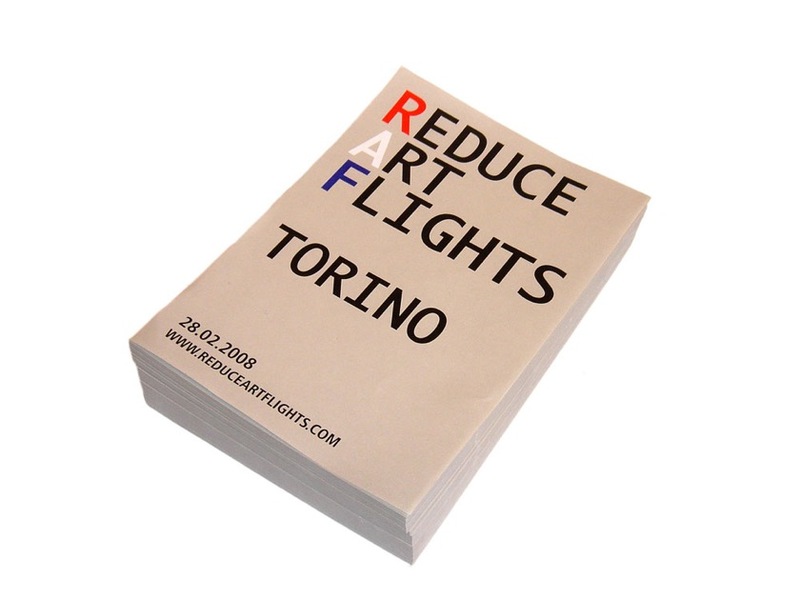 The Reduce Art Flights (28.02.08, Turin) leafleting campaign has been included in the exhibition 'Gustav Metzger, Decades 1959–2009' at the Serpentine Gallery in London (on view until 8 November 2009). The leaflet was produced in occasion of the Latitudes-curated exhibition 'Greenwashing. Environment: Perils, Promises and Perplexities' that took place between February and May 2008 at the Fondazione Sandretto Re Rebaudengo in Turin, Italy. For the occasion the invitation mailing was accompanied by the pamphlet encouraging visitors to arrange alternative travel to the exhibition. Milan-based Kult Magazine has published an article on art and ecology in their October issue written by art critic and curator Daniele Perra. In the section, Perra interviews curator Francesco Manacorda (curator of the exhibition 'Radical Nature: Art and Architecture for a Changing Planet 1969-2009' on view at the Barbican Art Gallery, London, until 18 October), as well as English artist Simon Starling and selects a few ongoing exhibitions and events that analyse the relationship between art and nature. In page 88 (see detail above) Perra mentioned Latitudes' ecology-related projects such as the 'Greenwashing. Environment: Perils, Promises and Perplexities...' exhibition at the Fondazione Sandretto in Turin in 2008, the guest-edition of UOVO #14 in 2007 and the publication 'Land, Art: A Cultural Ecology Handbook' in 2006, to introduce our participation in the forthcoming The Wånas Foundation seminar on Art and Ecology taking place on the 21 October in Knislinge, Sweden and in the symposium organised by Hinterland Projects on 26th November titled 'The evolving relationships between artists, the changing climate and new responsibilities'. We have just circulated the October 2009 Newsletter #16, you may read the English version or the versión española. If you would like to subscribe to our mailing list please fill your data on this contact form (see left), choose ONE language and confirm your subscription by clicking a link on the confirmation email we will send you. If you would like to read previous newsletters, click here. Check also our Latitudes' at www.lttds.org/blog for further news.